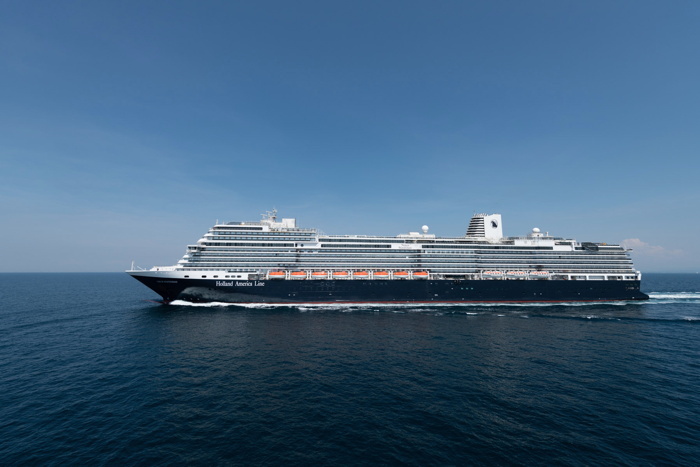 Holland America Line's Nieuw Statendam, the second Pinnacle Class ship in the fleet, returned to Fincantieri's Marghera shipyard in Italy Wednesday, Aug. 22, after successfully completing two sets of sea trials off the coast. Nieuw Statendam left Marghera Aug. 10 and performed the first set of sea trials over two days before going into dry dock at Fincantieri's Trieste shipyard, where the trial's data was reviewed and standard hull maintenance was performed. The ship sailed its second sea trials Aug. 18, making its way back to Marghera Aug. 22 where the finishing touches will be completed. "The sea trials are a highly anticipated milestone for any newbuild because it takes us one step closer to delivery, and we're thrilled that Nieuw Statendam gave a strong performance out in open water," said Orlando Ashford, Holland America Line's president. "There's a lot of buzz surrounding Nieuw Statendam and the innovations we're introducing on board. The ship is going to have an exciting debut in early December." During the sea trials, Nieuw Statendam underwent a series of performance tests on the ship's systems, machinery and engines. The shipyard's team of nautical officers, naval architects and builders tested the ship's maneuvering characteristics and safety systems. While much of the ship's design will be similar to Koningsdam, the first Pinnacle Class ship, Nieuw Statendam will have exclusive public spaces and its own style created by leading hospitality designer Adam D. Tihany and designer and architect Bjørn Storbraaten. The ship will feature all of the hallmarks of Pinnacle-Class design: grand, light-filled spaces; visual drama; and sumptuous interiors inspired by the fluid curves of musical instruments. Are you with Holland America Line? If you are a member of Holland America Line you may be interested in learning how to optimize your content on our network.